Salmon Stacks!! This super simple recipe is the perfect light and fresh snack, lunch, or light dinner! Sure to impress!!! This dish has layers of fluffy cilantro, lime rice. Salmon mixed with a spicy mayo. Smooth and creamy avocado. And fresh and cool cucumber. Forget getting that pricey sushi! Make this scrumptious snack at home! Hey y’all! Ever get that craving for sushi??? I know for sure my hubs can’t be the only one! It’s his favorite! And while I love going out to eat, sometimes we just need an easy solution at home for a fraction of the cost. And that, my friends, is where these Salmon Stacks come in!! These salmon stacks are SO fun!! I got this idea from one of those FB food videos, one from a fellow blogger at Skinnytaste. They are so simple and easy to make, and they look super impressive. The flavors meld into a flavorful and fresh snack, lunch or even a light dinner. 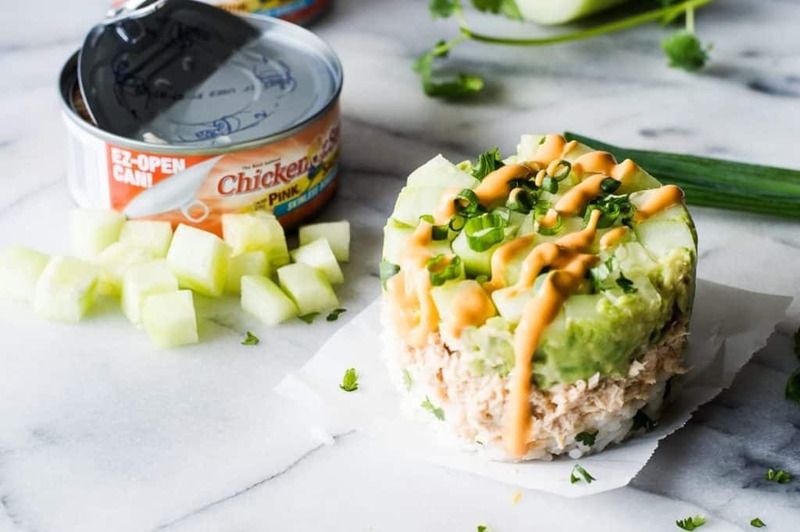 There’s fresh cucumber, creamy avocado, Chicken of the Sea® Skinless & Boneless Pink Salmon in EZ-Open Cans mixed with a hint of spicy mayo, and a layer of fluffy cilantro lime rice. All drizzled with some spicy mayo. 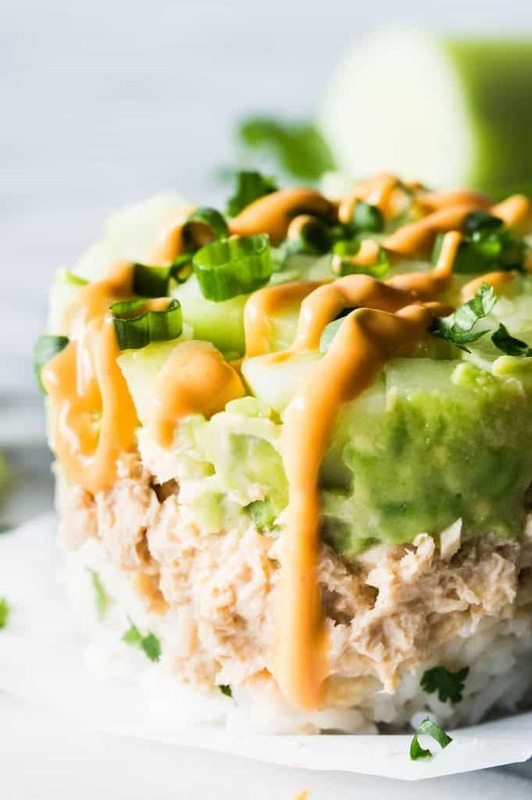 To make this dish even easier to make you can make the rice ahead of time, if you meal prep you can simply make a batch of rice and keep it in the fridge to toss this all together for lunches during the day. The best part?? 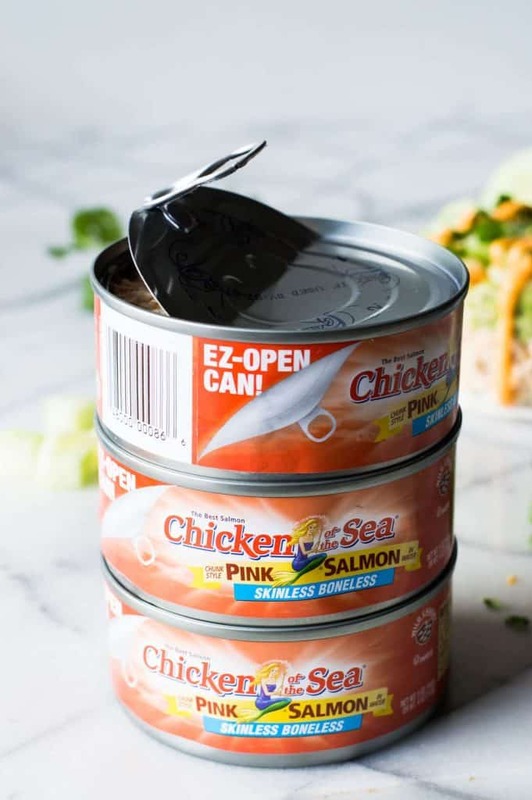 The Chicken of the Sea® Skinless & Boneless Pink Salmon in EZ-Open Cans. You can pack this up and take it to go and NOT have to worry about bringing a can opener. Because, who wants to carry a can opener around with them? Some quick notes on how I made the stack! I used my one cup measuring cup. Mashing the avocado helps to hold the layers together. As well as adding the spicy mayo to the salmon. I ran a butter knife along the inside of the cup to help release it, carefully turned it over onto a flat surface and just gently lift! It comes right out! Sprinkle some green onion on top and drizzle with spicy mayo. Super easy. Super flavorful. Super delish!! Plus! They’re having a fun game that you can take part in and maybe win!! The Pull It Off Game features a virtual “kitchen” setting in an online game where players try to grab a Chicken of the Sea can as it revolves on a Lazy Susan Table. Chicken of the Sea is giving y’all the chance to win $25,000 worth of instant prizes simply for playing the Pull It Off game and grabbing the correct EZ-Open can. This super simple recipe is the perfect light and fresh snack, lunch, or light dinner! Sure to impress!!! This dish has layers of fluffy cilantro, lime rice. Salmon mixed with a spicy mayo. Smooth and creamy avocado. And fresh and cool cucumber. Forget getting that pricey sushi! Make this scrumptious snack at home! Prepare the rice by cooking the white rice in the water according to the directions. Once cooked and cooled add in the lime juice, cilantro and a pinch of salt to taste. Mash the avocado in a small bowl and add the splash of lime juice, and pinch of salt. Stir to combine. Prepare the spicy mayo by mixing the mayonnaise, sriracha, and chili oil together. Add less oil and/or sriracha to make it less spicy if needed. Stir to combine. 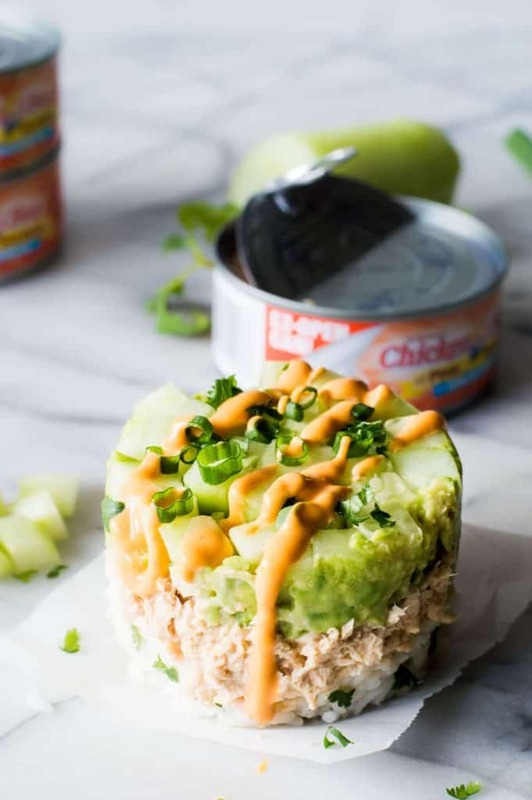 In a small bowl add the Chicken of the Sea® Skinless & Boneless Pink Salmon, add about 1 tablespoon of the spicy mayo and stir to combine. Salt to taste if needed. 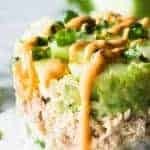 In a 1 cup measuring cup add the chopped cucumber, spread a layer of the mashed avocado. Press it down to ensure it is packed into the cup. 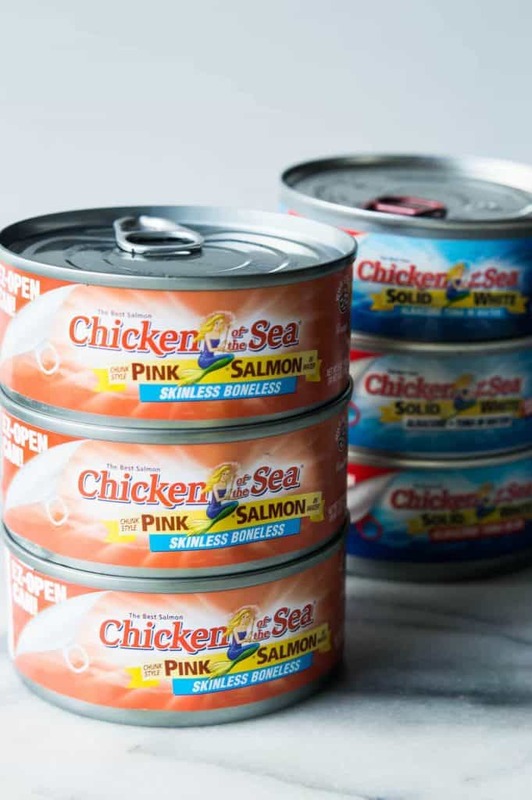 Add a layer of the Chicken of the Sea® Skinless & Boneless Pink Salmon mixture, press down to ensure that it is packed. Then add the layer of the cilantro lime rice, press down to pack. Run a butter knife along the inside of the cup. Turn the cup upside down carefully onto a flat surface and gently lift. 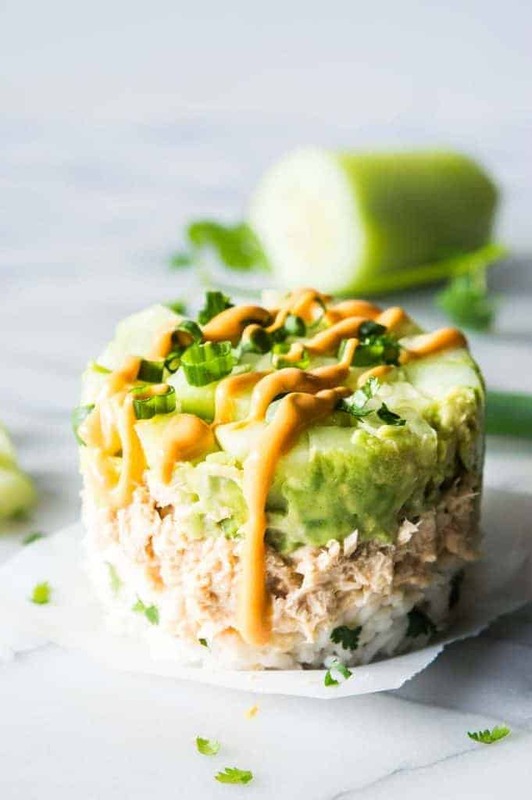 Sprinkle with green onion and drizzle with spicy mayo. Serve and enjoy! 0 Response to "Salmon Stack"